It would be best if you could upload an image of your model. You can definitely do it on this forum. 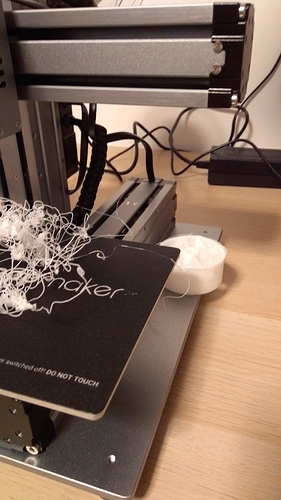 Sounds like your first layer is not sticking to the bed as well as it should. Perhaps you can try recalibrating the bed. You may also want to try raising the bed temperature by 5-10 degrees. Personally I set my bed temperature to 65C for the initial layer, then back it down to 60C for the rest of the print. If your model has a small surface area touching the print bed compared to the size of the model you’re printing, you may want to use a brim or even a raft. This will increase the surface area touching the bed. You’ll just have to do a bit more cleanup at the end. Another setting you can change is print speed. Print slower so the bed does not jerk too much in the y-axis and shake the model loose. Hope this helps and don’t give up. You just have to find your sweet spot for your prints. Thanks a lot for the suggestions. I tried with 60 degree for the initial layer and then 50. Also in this specific situation I did not use brim or raft. In the first case where it happend I used raft. I probably will try with 65 and 60 and see if this helps. Thanks a lot for your suggestions - I will not give up yet . Pictures are also attached now - for whatever reason I did not see the possibility to attach yesterday. as mention above, calibration is the key ! I also give the bed a quick wipe before each print with isopropyl alcohol, this helps a lot. on larger printer, I occasionally have problem with top left corner… recently I found AprintaPro PrintaFix really helps. I agree with the advice in this thread, and would add: Make certain your bed is level, level, level. Triple-check it backwards and forwards. Also, try using a raft. That will help alleviate any minute leveling issue that may be due to human error. You might want to cross-check your bed temp with a thermometer, just to make sure it is working. I typically print at 55 for first layer, and 50 for subsequent layers. PLA doesn’t seem to need much heat… I have printed at lower temps too. Don’t despair. Keep with it. You will get good results soon. Print small objects until you are able to print consistent results. Start with build volumes of 5 cubic centimeters. When you got that down, then scale up. Don’t be emotionally attached to the end-product in the early stages. I just spent over an hour writing down the things that I found help with printing on my SnapMaker. Surely not a pro advice, but I was experiencing the same with my printer (no matter which settings I configured, nothing could get stuck to my heated bed). After googling a bit, a found a trick that has worked just fine: spray some hairspray on the bed before printing. Here in Spain the recommendation was hairspray Fix, that can be bought in Carrefour. I actually bought a 3D printing spry/glue that can be sprayed on the bed. I tried that but do not yet have the feeling that it helped that much, but it might also be a combination of too much or too less spraying, temperatur etc. I need to try more. Thanks to everybody for the hints and tips and especially also the motivation to not stop and continue! Trying with different settings etc. I had already the feeling I am too stupid for using the printer and it’s good to hear that there are many different things I can try. So thanks to everybody!!! Unfortunately I did not have the opportunity to try further in the last days - but hope to have time in the next days. I have found that outside of the calibration that everyone is talking about, best thing heat the bed and apply a thin layer of glue from an Elmer’s glue stick. Never had a print lift with this method. So make sure the screws beneath the heat bed are tighten (they occasionally get loose). I normally calibrate to when you can feel the nozzle scratching the paper. Sometimes it’s easier to just reset the calibration and start from fresh. I am just using normally printer paper. The manual saids the gap between bed and nozzle should be 0.1mm, I have seen people using feeler gauge as well. I leveled my bed with a layer of blue painter’s tape. I start all my prints with a quick swipe of Elmer’s All Purpose glue stick. I’ve had no trouble with printer pulling free, even when there was minimal contact on the print bed. The residual glue cleans off quickly with water, once the print is freed from the bed. I faced this problem quite some time. Just unscrew the approbiate bolts below the bed a little bit in case calibration doesn’t level the bed. Furthermore I would lower the height of the printing nozzle. The recommended test with the “calibration paper” can be helpful if you lower the nozzle a bit further so that the paper cant be moved and then lift it 0,05mm. 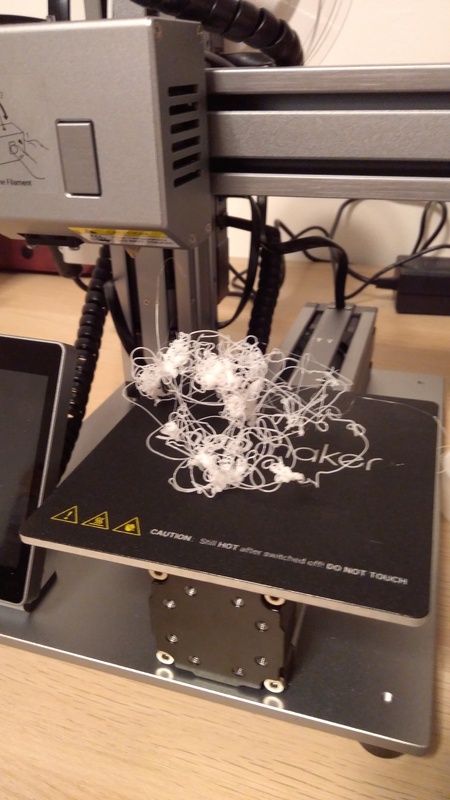 Calibration height varies with bed temperature, I notice… or you might have a tiny bit of plastic sticking in your nozzle making it’s height a few 1/10mm plus while when printing this plastic melts away and you lose these fractions of a millimeter. I agree with amo and peter’s advice. As for the paper, I use 20# general purpose office paper. I bring the nozzle down to the paper, and pull on the paper. It should glide across the nozzle with modest resistance… leaving an indentation trail – but only just. If it isn’t leaving an impression on the paper, its probably too loose. If you find that you have to really pull hard, you hear paper fibers crackling, or the paper rips (obviously) or it is carving out a ravine into the paper, then it is too close to the bed. Move in .05mm increments when calibrating. Your first layer of plastic should look pretty even across the bed. If there are areas that are not getting plastic, or it looks patchy or thin, then those parts of the bed are too close to the nozzle. If you find that the plastic is dropping onto the bed on the first layer (even a little), then the nozzle is too high (bed is too low) in that area. The nozzle should be lightly pressing the plastic directly onto the bed with no drop, like a bead of caulk or frosting from a baker’s bag. If the plastic has to drop onto the bed, then it won’t stick, because it starts to harden before it hits the bed, and the bed isn’t hot enough to soften plastic that is rigid, or even near rigid. But I have to say for the record, I have not had any issues whatsoever with prints not sticking. I triple check my leveling (backwards and forward), and put my first print layer at 55 degrees – and have never had an issue with it peeling off early, or not sticking. I’ve not needed to resort to glue stick, blue tape, abs slurry or any other techniques. Just the SnapMaker sticker. I wipe down with alcohol after a print, but that’s it. Even with my one newbie attempt with ABS, the first layer stuck like a dream. So, it makes me wonder… if you are positive that you have leveled correctly, and you are certain your bed is fully up to temp, then I wonder if something might be wrong with the unit. Have you tried using a raft? Or at least a brim? I’m a big fan of rafts because the bottom part of the actual print comes out so beautifully when I use a raft. No weird texture, and it releases easily. But, a raft will give you a nice big surface area to increase opportunity of cling, and it will also help address any minute leveling issues that might exist that are beyond human correction. I also recommend starting with small prints first, like 5 cubic cm. Get that down consistently, then step up the volume. Watch your first layers closely. Don’t leave the room until you get a few layers down. Stop the print if it begins to peel. A first layer that isn’t sticking at the beginning, will not change its mind later. Stick with it Patch. Have fun! Just to add to @moonglum’s excellent advice. I have noticed that the bed calibration varies with temperature and for me it’s been best if I heat the bed before calibrating. I do this by starting a print till the bed gets to temperature then immediately stopping the print and calibrating before the bed cools too much. Since doing this and cleaning the bed with alcohol each time I have not had a print fail to stick to the plain Snapmaker bed. I do use brims and/or rafts for more difficult prints. Here’s another tip that helps prints to stick. What this does is help to squeeze the filament onto the base and create a larger contact area and it sticks better. I notice that all of the settings in the SnapMaker software has this set to 100%. Our printer at work (a TAZ 6) has this set as high as 125% and we have very little problem with sticking. I’ve had very little problem on my SnapMaker but the last 6 or 8 prints I tried the 110% and they do seem to stick even better than before. Interesting. I’ll have to play around with that layer line width setting. What’s the advantage of this vs. setting a brim? Either way you have some clean up to do, correct? Probably less cleanup with the squish (wider line width). It may make the brim unnecessary in certain cases. Those 6 or 8 parts I did were actually almost hard to get off the base! I did my first print with Simplify3D last night and with the “official” FFF profile defaults, it’s more generous with filament on the first layer than Snapmaker3D is. I’m still using glue stick, but I may try a print without it as a test.